Should God be put second? 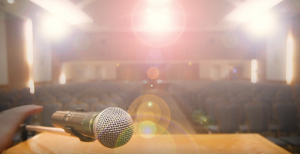 Donniel Hartman, an Orthodox rabbi and president of Jerusalem’s Shalom Hartman Institute, an educational powerhouse dedicated to invigorating Judaism, has recently published his second book. 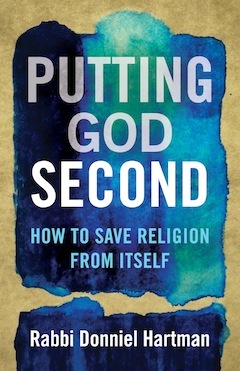 It is called Putting God Second: How to Save Religion from Itself (Beacon Press, 2016). Hartman thinks there is something missing in this discourse, which he explores in this book: queries like, what about religion can be powerful, profound and constructive, and might the issue simply be that people are getting it wrong? “The idea that I was testing for 10 years – that was researched, taught about and thought about – was that religion suffers from an internal autoimmune disease wherein it attacks its own goals,” said Hartman. “Religion has noble goals,” he contends, and is not only a source for evil, as some atheists say. “I think religion is, in fact, trying to produce kind individuals. There’s something inherent within the system, which can cause it to underachieve and fail to meet its aspiration. In short, the cause of that autoimmune disease is God – in particular, when God is put first. For Hartman, putting God second is a way of maintaining a religious life and faith in God, but without God undermining our responsibility to our fellow human beings. “This one transcendent God is something that I feel human beings have great difficulty assimilating into their system, into their lives, and that God has a potential to warp our consciousness,” said Hartman. “I call it ‘God intoxication,’ wherein everything else becomes unimportant. “It’s the encounter with God that can create this distortion. Who is more important, a human being or God? Human beings will again distort that message because, when it gets instilled into their minds, what can possibly be more important? “We see religious people, in the name of faith, harming, judging and insulting people, showing a lack of tolerance, pluralism – the same people who could, in their everyday lives, act decently, kindly. The minute religion is in the equation, there’s potential for it to get distorted,” he said. “God intoxication is not a flaw within religion, it’s embedded in the idea of monotheism. Some people argue we should get rid of God. My book tries to reestablish a life of faith. It doesn’t say to get rid of God or to put God 14th or 15th. At the end of the book is when you put God second, but you put God’s will first toward developing a religious life with God that immunizes us from this autoimmune disease. Hartman, who was born in the United States and spent 11 years in Montreal, is currently working on a Hebrew translation of the book. Previous Previous post: Did Franz Kafka have a son?